Every summer, hikers on the Pacific Crest Trail (PCT) use Sisters as a place to resupply, rest and connect with the non-trail world. You might notice them; they're the ones with the dusty boots and backpacks, heading for the library, the post office or the laundromat. They slip in and out of town, eager to get back on the trail and, if they're thru-hiking, to complete those last 650 miles to the Canadian border. By the time they get to Sisters, they've hit the 2,000-mile mark. Each of these hikers has a story and a trail name and a reason for pitting themselves against the rigors of a long and arduous trek. Last weekend, two men came into town who are part of a select group of military veterans participating in a unique outdoor therapy program called Warrior Hike. Kevin "Buttercup" Black is a career Marine with 30 years service who served in Saudi Arabia and Kuwait. Tom "Forty Five" Bielecki, a National Guardsman, served in Afghanistan in 2012. The men were picked up at the Santiam and McKenzie Pass trailheads by Sisters residents who knew about the program and volunteered to help. 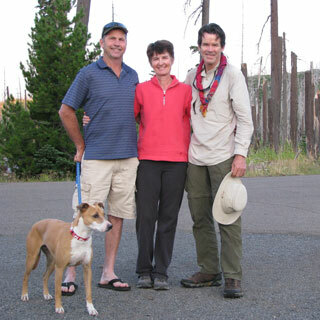 Two other veterans are also hiking the PCT and had either bypassed Sisters or hadn't yet arrived at press time. The program puts veterans on each of America's National Scenic Trails - the PCT, the Continental Divide Trail and the Appalachian Trail (AT). Founded by Marine Corps veteran Sean Gobin, who walked the Appalachian Trail in 2012, the Warrior Hike philosophy hearkens back to a statement made in 1948 by Earl Shaffer. He told friends he was going to "walk off the war" to work out the sights, sounds, and losses of World War II. Four months later he became the first person to hike the entire length of the Appalachian Trail. According to Earl, who lived a long and fruitful life as an outdoorsman, writer and poet, "Good planning, a sturdy physique, exceptional determination and ingenious adaptability are essential on a long and strenuous foot-journey." These characteristics certainly define our armed forces, and Warrior Hike's Walk Off The War program provides participating combat veterans with the equipment and supplies required to complete a six-month thru-hike. Warrior Hike also coordinates trail town support with veteran organizations and community groups and assists veterans with future employment opportunities through the program's partners and sponsors. The PCT Warrior Hikers soon discovered that sticking together for the entire 2,650 miles of the trail wasn't likely to happen. The distances between trail towns create a different challenge that isn't found on the AT, where there are towns every three days or so. After crossing the southern California desert, the men found themselves hiking their own hikes and working out individual routines. Black, who spent most of his military career in legal services and has seen the dark side of mankind, discovered the kindness of rural Westerners to be an unexpected benefit of his journey. "I've seen the worst of things," he said. "This isn't what I'm used to." He also noted that Warrior Hike always receives a positive response from other hikers and people he's met along the way. Black was hosted in Sisters by veteran Lance Trowbridge and transported by this correspondent. Bielecki has hiked nearly 4,000 miles since 2011 as well as serving his deployment in 2012. He met Warrior Hikers on the AT last year and decided to come west. He noted that he'd lost 81 pounds since the start of the hike and he, too, mentioned the kindness and respect he's seen while on the trail. There have been several caches of food and water left along the trail in coolers labeled "Warrior Hike." None of them were ever tampered with. His host was Mel Schwab, another Sisters veteran. For more information on the Warrior Hike program, visit www.warriorhike.com. Kudos to all, especially those trail angels that so often go unnamed. My brother and I were going to do something like this when we ended our duty in the late '60's. It wasn't to be, he was killed in action in Vietnam. He was my kid brother and the promise to hike the Appalachian Trail with him haunted me for years. In 2007, my wonderful wife, Jane, convinced me that I should go do it in his honor, so I did. I put his Purple Heart medal in my belly bag, and off we went. As usual, things didn't go as planned and after 600 miles, I left the trail for a six-artery heart-bypass. Three hundred days later, after a full recovery, I returned to the trail and finished hiking all 2,176 miles. I admire what you folks did in this article, the public doesn't realize what a challenge a long hike like this it, nor how cathartic it can be. One point that you mentioned that is so important to GI's when they return is to realize how many good people there are in this world. I recall coming home, on emergency leave when my brother was killed, and I had people spitting at me going through a major airport. I'll never get over that. The news is constantly filled with bad news, and bad people, but the best people can be found along America's trails, and the trail angels are special indeed! Author of: Three Hundred Zeroes: Lessons of the Heart on the Appalachian Trail. This comment has been hidden due to low approval.